My husband, Travis, and I began RVing, when our first son, Gabe, was not quite one year old. 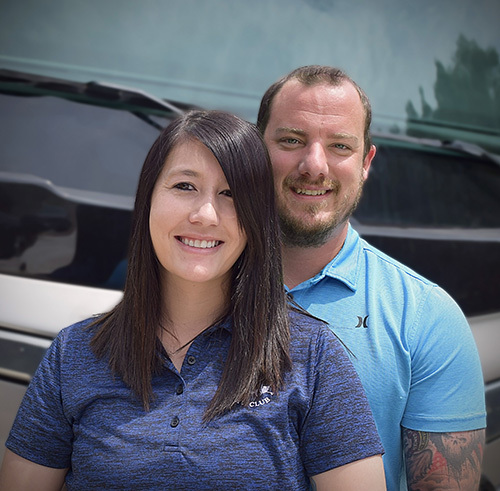 When shopping for our first RV, we looked for features that would accommodate his already established routines. We settled on a class C with bunks that we could modify into a crib. 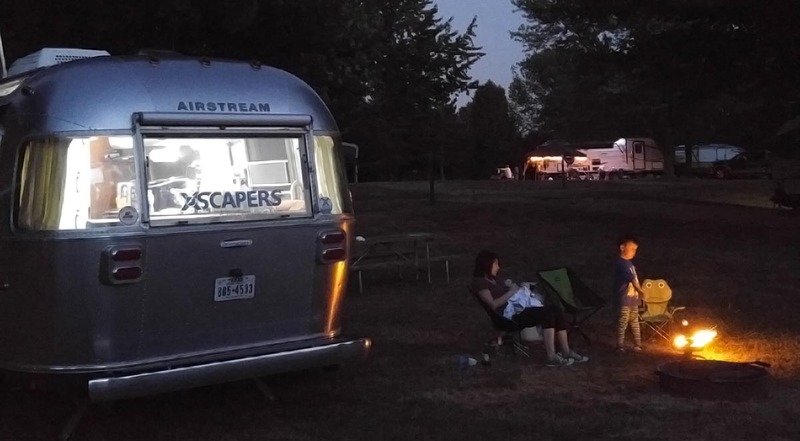 As Gabe grew and our needs changed, we traded our class C for a 27-foot Airstream. We loved the modern interior and enjoyed the minimal modifications we had to make. We traveled for four years as a family of three. When we found out we were expecting our second child, we were extremely excited. However, it raised a lot of questions concerning our RV lifestyle and what we could do within our limited space. Babies need a lot of stuff and we were already living in small quarters. 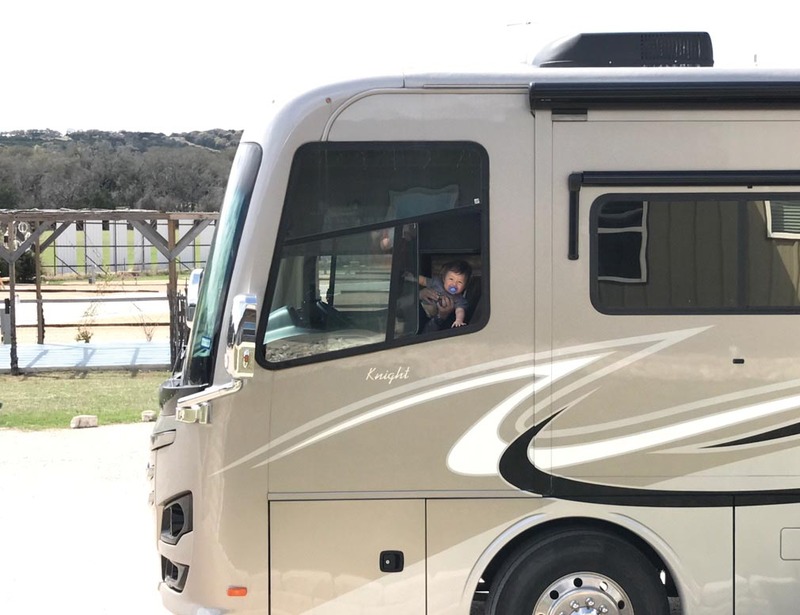 Two months after our second son, Decklin, arrived, we decided to trade in the Airstream for a 40-foot class A. 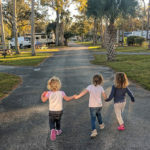 While we had grown attached to our trailer (Gabe cried and begged us not to let them take his “metal home” away), we knew the class A would be the best fit for RVing with kids. Decklin followed a simple routine of sleep, eat, play and repeat. Here’s how some of our daily routines work in the RV and why we felt we had outgrown our Airstream. 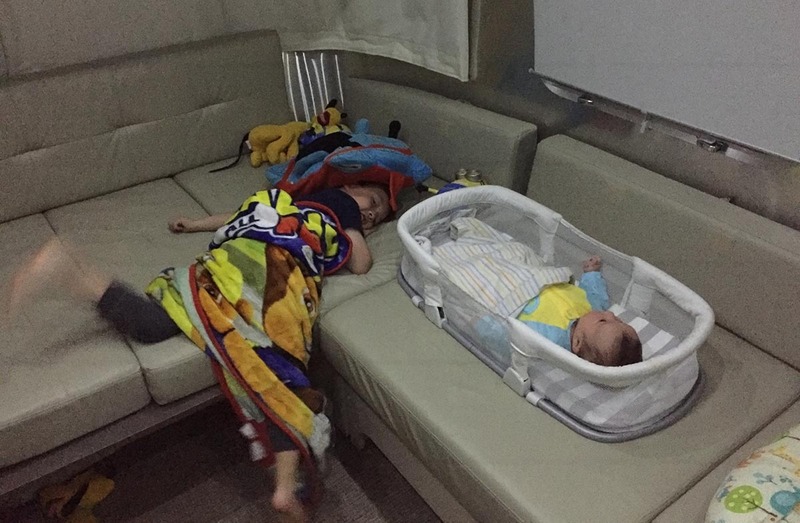 In the Airstream, Decklin slept in a “By Your Side Sleeper” that acted as a travel bassinet and nestled him into a spot next to Gabe on the couch. At first, this was perfect because he was tiny and wasn’t rolling over yet. For nap time, we used a rocker that took up most of our living room, but it worked well since he was small enough that he still slept for extended periods of time and could sleep through any noise. By the time he was two months old, this arrangement no longer worked. He was quickly outgrowing his sleeper with a foot hanging out of the edge, and he was becoming more alert and active, making naps in the rocker difficult. Our anxiety grew as we tried to figure out a new plan. Decklin was still unable to sleep in an open space, but we didn’t have much of a living room, and there was no extra space in the bedroom. We knew he needed to move into a “pack n’ play” (used as a crib because it is easy to break down, move and store during travel days), but where would it go? To remedy our situation, we made the decision to start looking for a larger RV. Adjusting to the large, 40-foot class-A took some time, but we soon fell in love with the space and comfort. There is plenty of space for a pack n’ play and, depending on our needs, it can fit in the living room or our bedroom. At night, Gabe sleeps on the fold-out couch and Decklin sleeps in the pack n’ play set up in the excess space between the kitchen and dinette. During the day, we move the pack n’ play to our bedroom, so he can nap undisturbed while we work in the living room. We are all happy with our current sleeping arrangements. When Decklin was only drinking bottles, we simply used a Boppy pillow and set him on the couch while we fed him. This worked well in both the Airstream and class A, until he transitioned to solid food. Now, we use a highchair that clips onto a chair. We store the highchair on top of a ledge of counter space that runs along the side of the RV opposite the kitchen. It is out of the way and it doesn’t take up any needed space. This would have become an issue in the Airstream as there wasn’t space to use, or store, the chair. If we had stayed in the Airstream, we would have purchased a highchair that clips directly onto the table. Decklin wasn’t active while we were in the Airstream; otherwise, we would have had to put an activity mat on the living room floor, and we would have had to walk over him to get to the bathroom or bedroom. In the class-A, we carry a Jumperoo to keep him entertained during the work day. While this takes up quite a bit of floor space, it is worth it to us to keep our hands free while working. During travel days, we break it down and put it in a storage bay. For most of the day, though, he is happy playing on the floor with his toys and activity mat. Once we made the switch to the class-A, it was evident that we were gaining more time on travel days. When we traveled with the truck pulling the Airstream, hours were added to each day’s work because we had to climb over the seats to feed Decklin, give him his pacifier and change his diaper. I had forgotten the days where Gabe or I could take a rest room break while going down the road or make sandwiches for lunch. Now, I sit comfortably on the couch and feed Decklin in his car seat vs. having to squeeze between him and Gabe in the truck. The biggest challenge we face is our night-time routine. The boys go to sleep much earlier than we do. For example, Decklin is ready for bed around 7:30 p.m. and Gabe shortly after, around 8:00 p.m.
We usually prefer to stay up late and aren’t ready to give up the living room, but it is a sacrifice we must make living in a small space. Occasionally, we hook up the baby monitor and sit outside to escape having to watch TV in bed. However, we still have to worry about sneaking back quietly so we don’t wake the baby. There are also times when we put Decklin to sleep in the back bedroom and let Gabe stay up late so we can enjoy the living room, or finish work. However, in doing this, Decklin has to stay in our room all night because we are not able to move the pack n’ play down the hallway without collapsing it. There are also times during the work day when working in close quarters can be difficult. 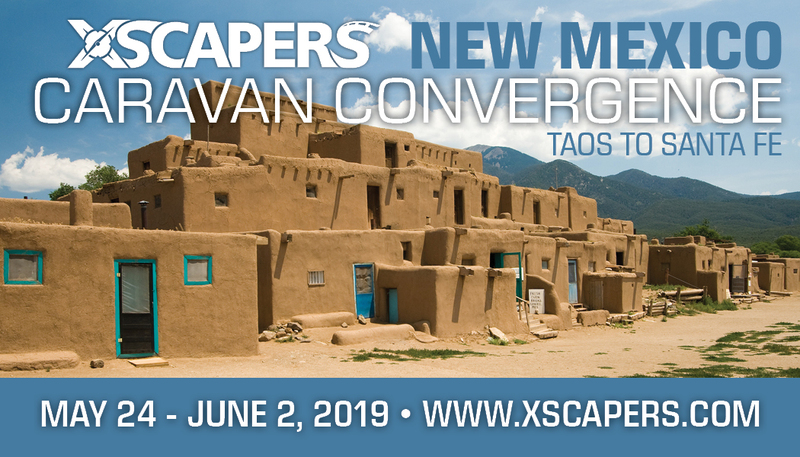 Travis and I both work full-time for Escapees and, while we have separate duties and projects, quite often we work together and are required to make phone calls and attend video conference meetings together. These tasks can be challenging with a baby. We either have to keep Decklin entertained, or time our work communications around his naps. Although it can cause us stress and anxiety, we always seem to make it work. 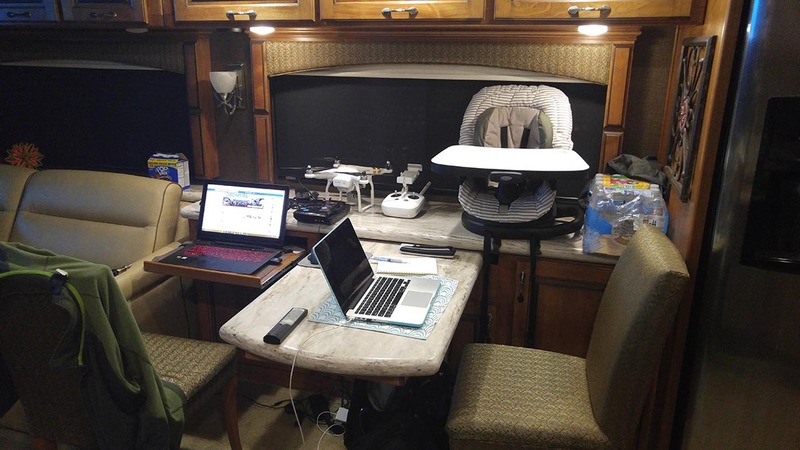 Even with its challenges, we couldn’t be happier sharing our RV lifestyle with our children. They get to experience many new places at such a young age, and we know this will play a role in shaping them into wonderful adults. We have adapted and overcome all the challenges we foresaw when we found out we were expecting, and we are a stronger family for it. Our older son, Gabe, has always loved the lifestyle, and I have no doubt that Decklin will, too. 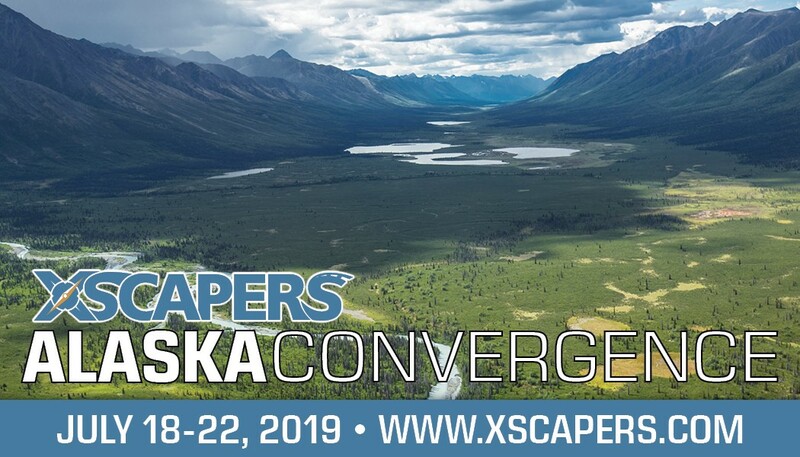 We know this lifestyle will always be a part of our future, and we are so excited to see where the adventure takes us! 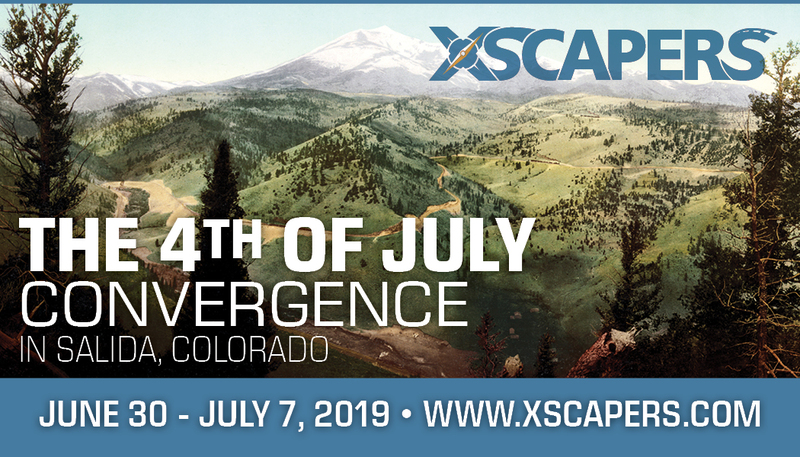 Melanie is vice president of Escapees RV Club and co-founder of the Xscapers lifestyle group. 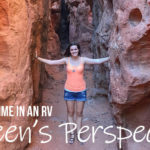 She has been RVing with her husband and two sons since 2011, but was introduced to the lifestyle at an early age through family vacations. Wanderlust and travel have always played a large role in her life. This is a really helpful article, as my wife and I are in the early stages of planning for our transition to a full-time RV lifestyle. We have a 7 month old, and plan to have one more before we leave in 23 months (in grad school currently). One thing we keep thinking about when we look at different Class A and C motorhomes is removing the queen bed from the bedroom in the rear, and putting in two small cribs along the “TV wall” and a couch along the other wall. This would convert the bedroom into a kids sleeping area / open play/TV room during the day. That would leave us parents sleeping on the sofa bed, but would give us the freedom of staying up later, having access to the kitchen and bathroom, with the kids sleeping behind the closed door in the bedroom. Just wondering if you gave that any thought, and if so, what was the reason or would be the reason you would see that not working out?